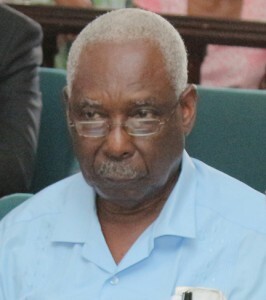 PNCR General Secretary, Oscar Clarke. The People’s National Congress Reform (PNCR)- the largest political party in the coalition-led administration- has cautioned its members against building their expectations too high and sidelining other races and opponents. This is contained in the report by party General Secretary, Oscar Clarke that was delivered to the 19th Biennial Congress that was held from August 26 to 28, 2016. “After twenty-three years in opposition our members and supporters now have high expectations that their party would be able to deliver everything that they were denied for twenty-three years under the previous PPP/C (People’s Progressive Party Civic) government,” he said. Clarke said while the expectation was not “unreasonable,” he appealed to party members to be patient as government seeks to attract investments. “Party members must try to understand and appreciate the many constraints under which the new National Leadership of the country is operating, not least of which is the need for investments that will provide job opportunities for people, especially young people,” said the veteran politician in his six-page report. President David Granger is already on record as saying that government would seek to cultivate the enabling environment for individuals and the private sector to create jobs. One of the A Partnership for National Unity + Alliance For Change’s (APNU+AFC) strongest campaign themes was the creation of jobs for youths. The PNCR is the largest and most influential party in APNU which teamed up with the AFC to campaign and form the government after winning the May, 2015 general elections by a slim one-seat majority. In apparent reference to calls by PNCR supporters to sack certain persons who had been appointed by the PPPC-led administration to ensure that government’s projects and programmes are not sabotaged and that PNCR supporters are employed, the General Secretary ruled out any form of discrimination. “We also need to bear in mind that the new National Leadership has a mandate to try to forge national consensus within our country and, therefore, cannot be expected to condone discriminatory practices whether racially or politically motivated,” he said. The PPPC has repeatedly accused the coalition government of firing mostly East Indians – largely that opposition party’s support-base- Amerindians and Afro-Guyanese who are pro-PPP. The PNCR draws the bulk of its support from among Afro-Guyanese. Remarking that despite differences among coalition partners, Clarke also called on party faithful to unite in supporting government in solving the myriad problems that it has inherited from the past. “It is now up to us to believe and accept that we are on the correct path and stop the necessary infighting and mindless negative criticism which is impeding the pace of progress towards finding solutions to our real problems of poverty and backwardness,” he said. The General Secretary charged PNCR supporters to give leadership and encourage others to seize every opportunity provided for self-development, community and national development.